Kapamilya comedian Wacky Kiray impressed both the judges and viewers with his death-defying wire balancing act and emerged as the first Greatest Entertainer in ABS-CBN’s talent-variety show “I Can Do That,” which aired outside the Philippines via TFC and which streamed simulcast its Philippine airing via TFC online (www.TFC.tv) in key countries worldwide. 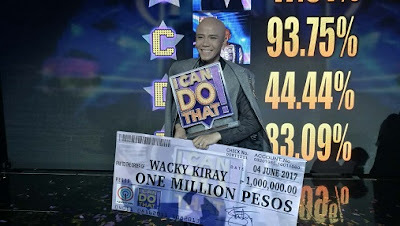 Viray took home Php 1 million after he wowed judges and television icons Judy Ann Santos-Agoncillo and Boy Abunda, as well as viewers nationwide with his heart-pounding performance and garnered a total score of 93.75%, the combined Philippine public text votes and judges’ scores. Overwhelmed with his victory, Viray got emotional as he thanked his family, and the people who gave him their full support and voted for him. “Lord, maraming-maraming salamat. Sa lahat ng sumuporta, salamat po. Sa pamilya ko, sobrang salamat po (Thank you very much to the Lord, my family and all those who supported me)”, he said while in tears. He also thanked mentor Unkabogable Box Office Star Vice Ganda. Meantime, hailed as the second placer was actress Cristine Reyes, who got a score of 83.09% with her blazing fire dancing act and won Php 300,000. Actor-model Daniel Matsunaga was declared third place winner after he wowed the crowd with his aerial pole act, hitting a score of 47.81% and bringing home Php 200,000. Taking the fourth place was television personality and youtube sensation Gab Valenciano, who showed gracefulness in his ring man act and won Php 100,000 after he scored 44.44%. More viewers tuned in for the final performances of the four remaining iCandidates, which reflected at the June 3 data from Kantar Media Television Audience Measurement, a local television measurement company, recording a national TV rating of 19.7%. Netizens also expressed on social media their support to their favorite iCandidate grand finalist, which made the official hashtags #iCanDoThatBattleForGreatness and #iCanDoThatTheGreatestEntertainer a trending topic on Twitter. “I Can Do That” was developed by Israel’s Armoza Formats, with local versions in 20 countries, including the United States, which named singer Nicole Scherzinger its first Greatest Entertainer. 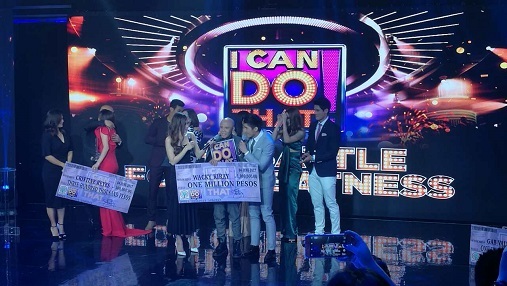 Get to witness the breathtaking and exciting final performances of Kiray, Matsunaga, Reyes, and Valenciano in the talent-search show “I Can Do That,” again via TFC online (www.TFC.tv) and TFC IPTV, available until July 4 in key countries worldwide. For more updates about your favorite Kapamilya shows, visit TFC’s Facebook page applicable for your area. Connect with fellow global Kapamilyas and follow @KapamilyaTFC on Twitter and Instagram.